My personal experience of scanning negatives used to be rather poor: pale colours, blurry details, colour noise, etc. On the picture below the same image scanned from 35mm negative some while ago is compared to the improved one. The techniques described below are applied to the image on the right. Both scans are done via Plustek OpticFilm 8100 scanner. The sequence and logic of operations is what matters the most, and thus, they will be applicable to a wide range of other devices. Improving negative scan process. A picture taken in Marseille, France. Kiev 4a, Kodak Portra 160. The main idea is to allow your scanner to acquire an image with highest possible resolution avoiding scanner software image processing as much as possible. And only then the image can be digitally altered in dedicated software (GIMP, Photoshop). Why? Because some of software scanner features, i.e. dust removal, grain reduction, decrease the image quality, i.e. blurring the fine details of acquired image. As intermediate file format we recommend uncompressed TIFF. It can be deleted as soon as you obtain your final image to preserve some space. But it is not necessary. So my negative scanning process can be described as follows. 1. To obtain sharp image I activate Multi-Exposure and scan with 1/4 resolution of 1800 ppi in SilverFast (software coming with Plustek scanner). The sharpness can be verified comparing the pixel patterns at the high zoom level. Images without multi exposure (on the left) and with multi exposure, which gives sharper details (on the right). 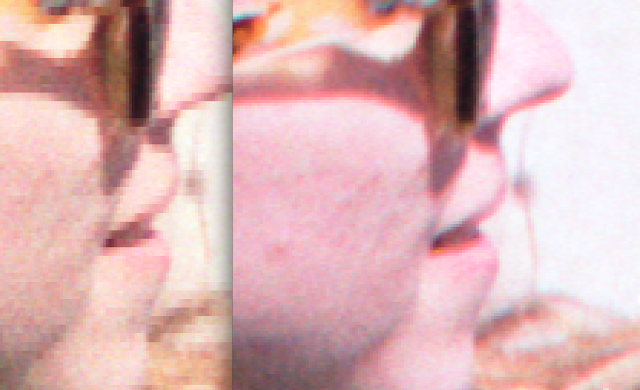 Both scanned with the same resolution. Tip: if you do not have the multi exposure mode available, just increase the scanning resolution. 2. Sometimes I use NegaFix to fix the film vendor-related colours (not always necessary). In the image above, Vendor: Kodak, Filmtype: Portra, ISO/ASA: 160 VC. And that's it! No more scanner software enhancements. The CCR and Auto checkboxes must remain unchecked. 1. To remove color noise, Reduce Noise filter is utilised. Strength option is set to zero, otherwise the image would be blurred. Reduce color noise, or equivalent option, is set around 60-80%. Other settings, are usually untouched. We use TIFF uncompressed format, so JPEG artefacts are unlikely to occur. – Hey just a minute, why do we need this at all? Film is analogue source and does not introduce digital noice. – Yes, however during the digitizing process, scanner will introduce noise and other digital defects. That's why we need to reduce it on this stage. 2. To remove scratches manually Clone stamp and Healing batch are employed. 3. For color enhancement, Auto tone is useful. If you use GIMP, try Colors–Auto–White Balance instead. Surprisingly, but this option seems to be working much better than Levels–Auto in Photoshop. You may also want to change color levels per channel, alter saturation and vibrance, edit curves or contrast and exposure, and do all your other favourite image editing stuff. 4. And the last step, add sharpness to your image via overlaying highpass filtered copy of the picture layer. Voila! On the one hand, there is no magic button to obtain a brilliant image, on the other hand, scanning the analogue shot you enter the digital territory where the image processing rules are crucial to obtain a picture of high quality.